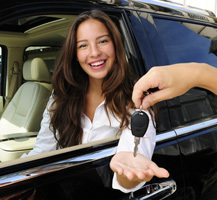 Alhambra Credit Union wants to get you behind the wheel of a new or pre-owned vehicle today. Getting the best deal on your vehicle can be stressful. Getting the best deal on your vehicle loan can be stress free. Alhambra Credit Union’s low rates, flexible terms, and a speedy process take the stress out of getting the most affordable vehicle loan. Want some advice on buying a car? Click here. How about calculators to help assess the financial details? Click here. Take a look at our competitive vehicle loan rates. Want to apply for a vehicle loan today? Click here for our application. Help protect your vehicle loan. Many times primary auto insurance settlements don’t pay off your loan balance. When you buy a new or used vehicle, there’s no way to know if it will be stolen or totaled in an accident. With MEMBER’S CHOICE Guaranteed Asset Protection, you’re protecting your vehicle investment against a possible financial loss. The fee can be included with your monthly payments or made separately by cash, check, charge or possibly electronic funds transfer. If there’s a difference between what you owe on your loan and the value of your vehicle, GAP will help pay the difference based on the terms of your member agreement. By taking a few simple steps while signing your loan paperwork, you’re helping take responsibility for your financial future. Your loan officer can show you how. You can cancel within 90 days for a full refund. If you have questions, simply contact your credit union. It’s hard to anticipate vehicle repairs and maintenance. Budgeting for this can be difficult and can tie up funds earmarked for other needs. MEMBER’S CHOICE Mechanical Repair Coverage (MRC) will help pay for repairs on your vehicle,* and give you the control to keep your car on the road where it should be. If your vehicle breaks down, Mechanical Repair Coverage will pay for the cost of covered repairs, less any deductible, at any authorized repair facility in the U.S. or Canada. By taking a few simple steps, while signing your loan paperwork, you’re taking responsibility for your financial future. Your loan officer can show you how. You can cancel within 30 days for a full refund. Or anytime after that. If at any time you have questions, simply contact your credit union. Typically, as the age of your vehicle increases so does the average cost of repairs. That’s why Mechanical Repair Coverage is so valuable. Additionally, MRC provides rental reimbursement, 24-hour emergency roadside assistance and travel expense reimbursement. And if you sell your vehicle privately, the coverage can be transferred. Apply for a loan anytime, anywhere using your smartphone. Just scan your driver’s license* and AskAuto app prefills your loan application with your personal information and saved vehicle information. Saves you time and key strokes.